"This film shows Queen Elizabeth II and Prince Philip on their tour of the Maritime provinces. The Corner Brook pulp and paper plant, the Schefferville, Québec, open-pit iron mine, and the cities of St. John's, Fredericton and Charlottetown are main stops. A commemorative conference in Halifax is also shown." National Film Board of Canada. 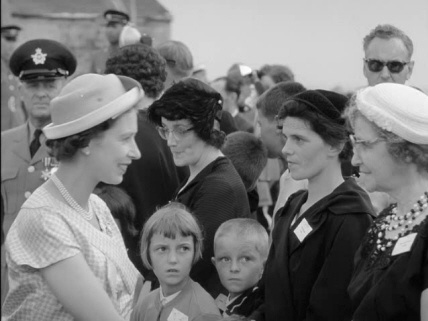 "NFB -- Royal Visit '59 - The Maritimes." National Film Board of Canada. http://onf-nfb.gc.ca/en/our-collection/?idfilm=15369.